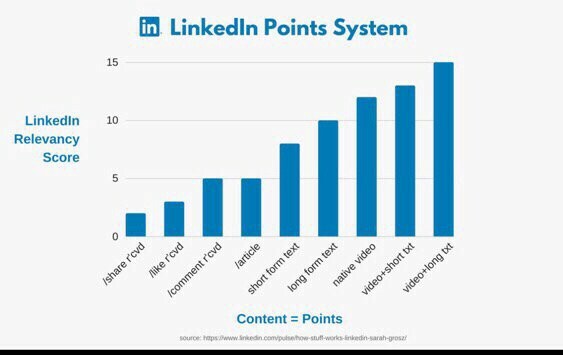 This shows how LinkedIn determines the value of your post to show to your network. LinkedIn conjures different images among those who use it and those who know it by reputation. Is it best for professional networking or a place to find a job? Bobby Umar has a different take. He sees and uses LinkedIn as a power tool. Umar capitalizes on the platform as one of Inc magazine’s Top 100 Speakers. He also is known as an author and networking, personal brand and parenting expert. Umar, who lives in Toronto, is a LinkedIn fan who happily helps others keep up with changes so they also succeed with their business and personal goals. He noted that LinkedIn has changed, and most people are using it wrong. These changes have taken place since Microsoft bought out LinkedIn and took over. “The first biggest change on the new LinkedIn is that the algorithm is promoting far more engagement and time spent on the platform,” Umar said. “When you post natively, you’d get 100 times more engagement than before. Users will benefit most by sharing their own creations. “You will get far more traction by sharing your own content natively on the site,” Umar said. “If you do share an article, make sure you add your own value-added insights. As with any other marketing plan, know and support your audience. “If you want more relevance with your content, get more engagement and build a strong thought leadership personal brand, be sure to create tremendous value in your content and serve your target audience or tribe,” Umar said. LinkedIn wants to encourage users not to hit and run. Overall time on LinkedIn has varied through the years. The new features make lingering a greater enticement. “I was one of the first million users in 2004,” Umar said. “Then I just shared articles there four to six times per day. I spent about one hour per week on the site. Now I spend about 10 hours per week — if not more. LinkedIn shares a negative common trait with other social networks — particularly for women — as an occasional toxic environment. “I have found toxicity on there, but on Twitter and Facebook as well — mostly on Twitter, though,” Umar said. “If you curate the right audience, it will be less toxic. Give LinkedIn a try because the time is ideal now. Among his hopes, Umar would like LinkedIn to add a personalization message for adding someone via their smartphone app. “Now that LinkedIn has native videos to upload, they definitely need to have more livestream videos for professional events, just like Twitter, Facebook and Instagram have,” he said. Is it too salesy and promotional? Is it all about them and nothing about serving others? Sloppy, lazy or not well thought about. Asked about why LinkedIn does not create a message list, Umar explained. Email — often GenX or Boomers. Are they a valuable connection? If so, then go for it. What is your system for determining the best connections to add? Think of it as someone coming up to you at a networking event. Would you engage? Don’t feel bad to not accept a request. Facebook: Anyone I know personally. LinkedIn: Personal and strategic connections. Twitter and Instagram: Anyone who is interested and engaged appropriately. “For LinkedIn, there is great value in the status update of less than 1,300 characters,” Umar said. “There is secondary value in an article of 1,000 or 2,000 words. It depends on the topic. Ask for help when you need it, and maybe get a coach. Have empathy, knowing they are projecting their pain or damage. Hurt people hurt people. Either report or block, delete, ignore or respond to call out for more professionalism. No headshot equals a bag over your head. No response is the same as awkward silence with someone you are networking with. Saying something inappropriate is bad everywhere. For those who want to do social media videos or execute them better, Umar has created a video with a “Big Tip” on building a library of content, plus his 12-module course on how to master your video on LinkedIn. Jim Katzaman is a manager at Largo Financial Services and worked in public affairs for the Air Force and federal government. You can connect with him on Twitter, Facebook and LinkedIn. Plug in the power tool you’ve never used was originally published in Marketing And Growth Hacking on Medium, where people are continuing the conversation by highlighting and responding to this story. Biz Tips: Is it worth having native LinkedIn videos? Biz Tips: Do Brands Still Need to Engage in Influencer Marketing?